In Europe, the “reserve base” of credit institutions is created by the collective balance of any deposit account with a maturity or notice period of less than 2 years, plus the outstanding amount of any debt securities (issued by the bank) with a maturity of also less than 2 years. These are assigned a 1% reserve coefficient. Longer-term funding liabilities such as time deposits or debt issues (either with maturities 2 years and beyond) are exempted by applying a 0% coefficient. Included in this category is, surprisingly enough, repo liabilities (why or whether that makes much sense is another discussion). In total, the level of required reserves tells us a little something about the nature and status of lending in Europe. There is still, in terms of lending, a money multiplier effect, only the story begins here not ends. In other words, the ECB can obviously greatly affect the level of reserves on balance or available to the system, but unlike in days long ago that isn’t close to the most prominent consideration facing any individual bank in Europe (which is why the requirement is just 1% and only applied to a majority subset of liabilities). As of the latest simple balance sheet figures, the ECB reports an aggregate reserve requirement of €123.7 billion for the system. Through its various LSAP’s (large scale asset purchases), the central bank has created €2.01 trillion in bank reserves (not subtracting autonomous factors) available to institutions via either their current or deposit account (despite this latter “paying” -40 bps in “interest”). Europe’s banks, on the surface, surely aren’t suffering for reserve requirements. Yet, they refuse to lend nor create what credit institutions are always supposed to lend and create. To that end, as the ECB has continually added to bank reserves, the level of required reserves has barely budged. That’s especially true over the past twelve months dating back to May 2017. 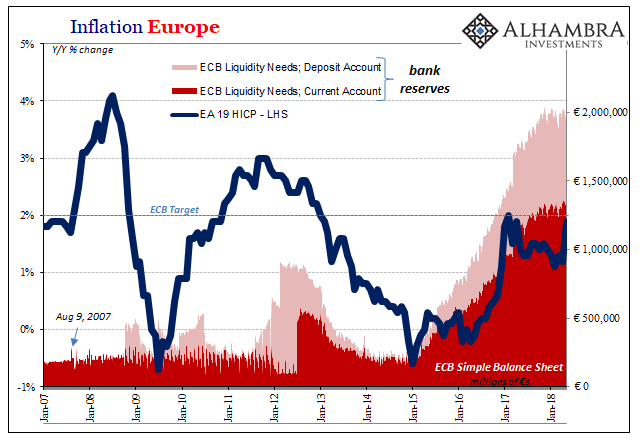 At that time, required reserves were €122.3 billion, meaning that over the last year they have increased by next to nothing, a total €1.4 billion despite the ECB adding another €245.8 billion in bank reserves to the almost €2 trillion already created by them. Monetary policymakers take no account of balance sheet capacity even though it is staring them right in the face here. This is the main reason why despite so much non-money money printing there is no confirmation via inflation. The ECB, like the Fed and BoJ, only further adds to the empirical evidence disproving their monetary competence. 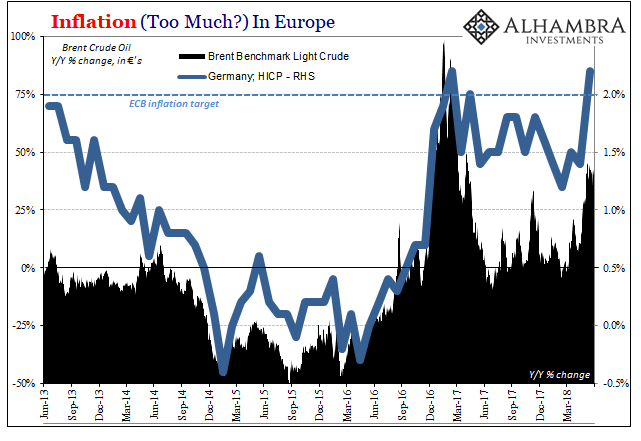 Instead, European inflation, like that in America and elsewhere, is driven entirely by oil prices. As of the latest figures for May 2018, the ECB will surely take credit for the bump in inflation. Europe’s HICP rate accelerated wildly to 1.9%, nearly touching the central bank’s target for only the second time in five years, from a more dismal 1.2% in April. While outwardly European central bankers will express the most positive sentiments, they know they are still in deep trouble. The jump in inflation is entirely a product of the Brent crude benchmark. And yet, despite an average 40% year-over-year gain in the month of May (and the energy index for the HICP rising a large 6.1%), the overall index still somehow failed to hit 2%. Even with an outsized energy price contribution, there remains monetarily a lot missing from the European economic picture as the mainstream narrative has it (booming). Without banks and credit growth, the European economy just isn’t growing like it is “supposed to.” That means, for the ECB’s target and consumer price mandate, the close proximity of the HICP to that target is a transitory one (exactly like last year). Core inflation, stripping out energy as well as food, alcohol, and tobacco prices, rose just 1.1% in May after gaining 0.7% in April. No baseline acceleration is indicated. This is not the recipe for winding down QE in the manner in which everyone thought at its inception. The media will claim, as they always do, that with this latest number success is approaching and that an inflation as well as economic breakout is at hand, but there is really no evidence that’s actually the case. Instead, again, it is entirely predicated on oil prices surging (meaning a healthy contribution of base effects, too). For inflation to continue unless something actually and meaningfully changes underlying money and economy, that would require continued massive increases in oil prices. Brent would have to rise by 40+% month after month just to stay near 2%, an outcome that would not be very welcome to Europe’s millions of workers who still have to deal with high unemployment in many countries in addition to low and often non-existent wage gains. Policymakers would have to hope for oil to wreck what little economic momentum encountered under worldwide reflation just to get to 2% and stay there. To have successfully completed QE or to do so in the near future would mean something other than oil prices. There is, as always, just no sign of that other, starting with what is, and is not, money to the modern bank.